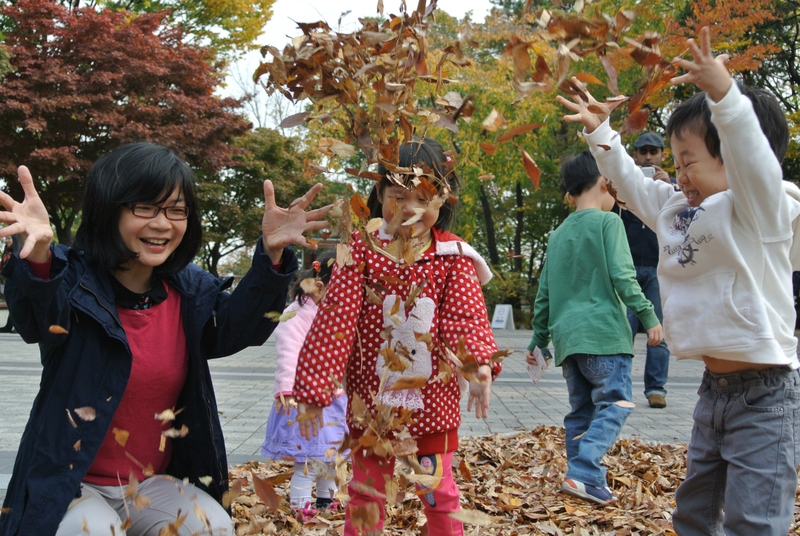 Today we will be walking up to Namsan Cable car which is a 15 mins uphill stroll from our lodge (EO Residence). 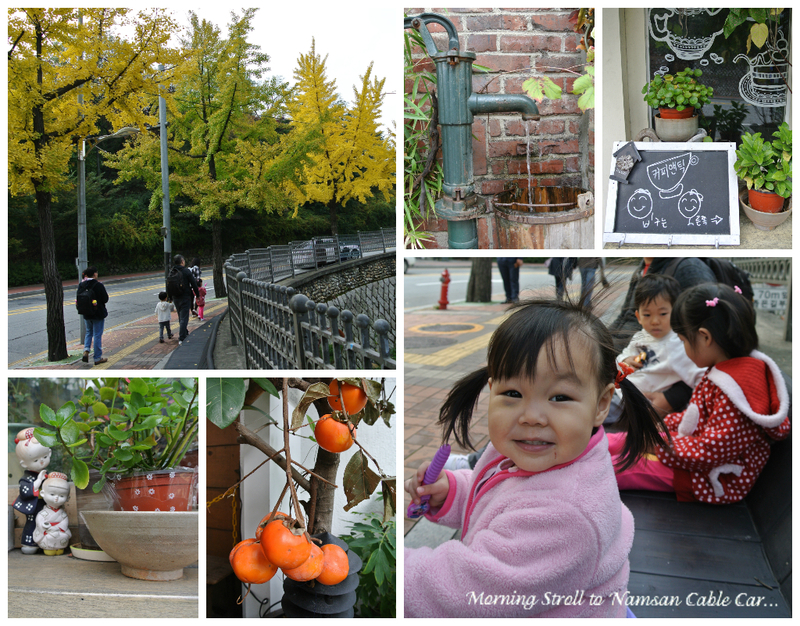 Though the walk is an uphill stroll, the walk was pleasant with Autumn foliage and pleasant cafe alone the way to the the cable car up to N Seoul Tower. 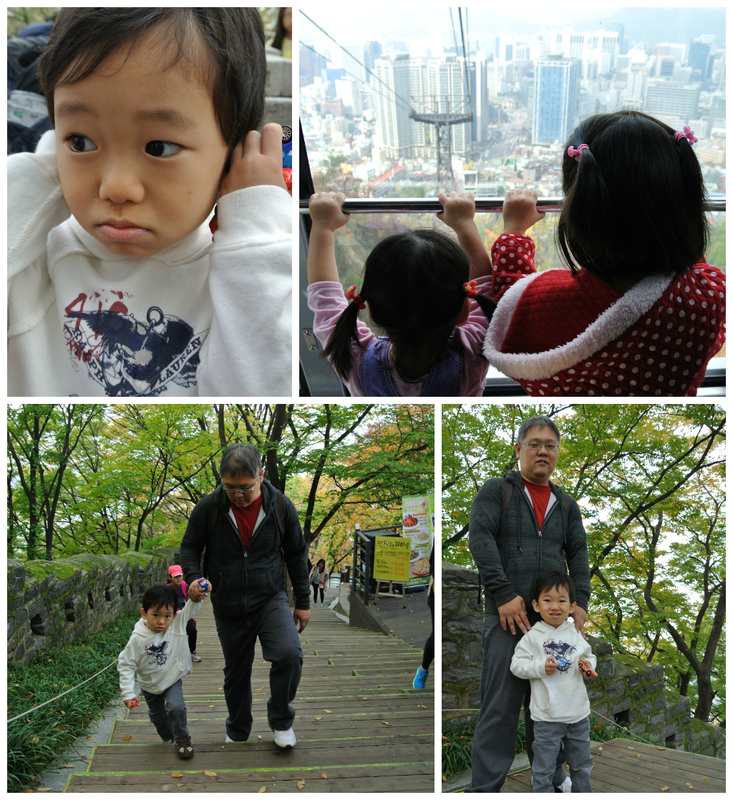 The journey up to top of Namsan hill by the cable car takes around 10-15mins. 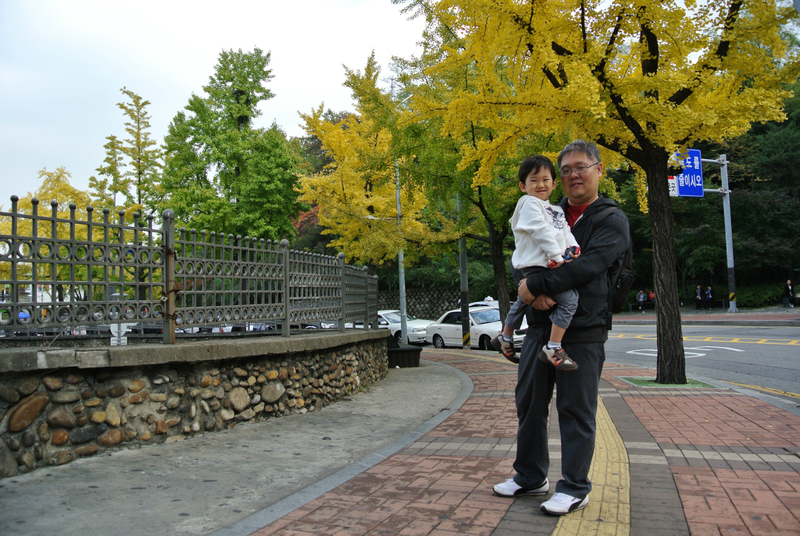 Nice greenery and more Autumn foliage on our walk towards Namsan Tower. 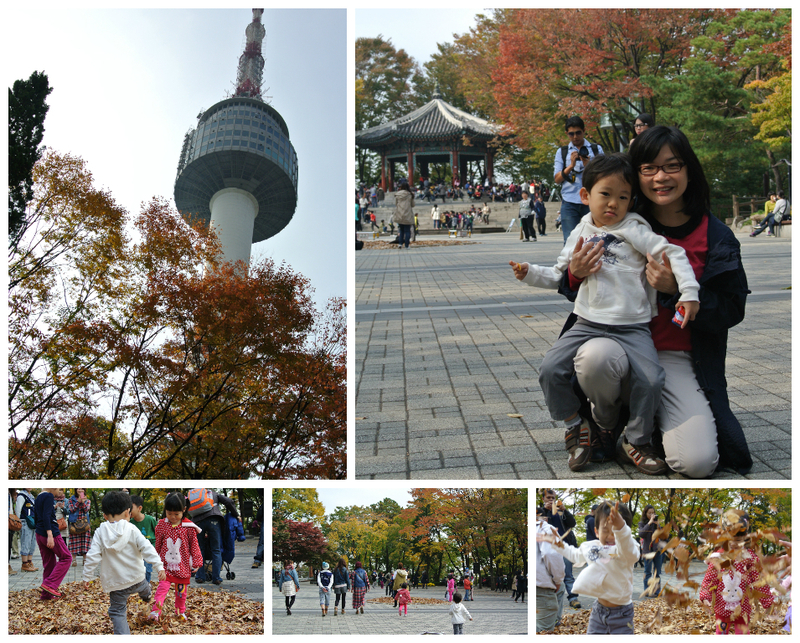 After taking a lift that took less then a minute to travel up to the top, we reached on the observatory deck of N Seoul Tower. 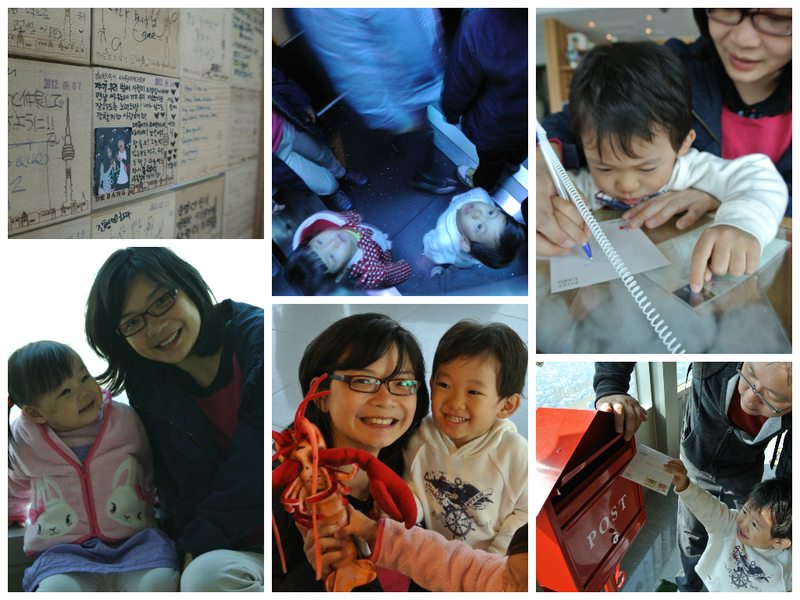 Kids were excited with the view as well as various activities for the kids to do on the observatory deck. Beside looking through the binocular to view the details on the landscape of Seoul, Jaydon also sent a postcard to grand mom from the Namsan tower. We decided to give the Teddy Bear Museum a missed (since we have visited 2 teddy bear museum in Jeju), but we visited famous love padlock deck which can be seen hanging on the fences around the base level of N Seoul Tower. 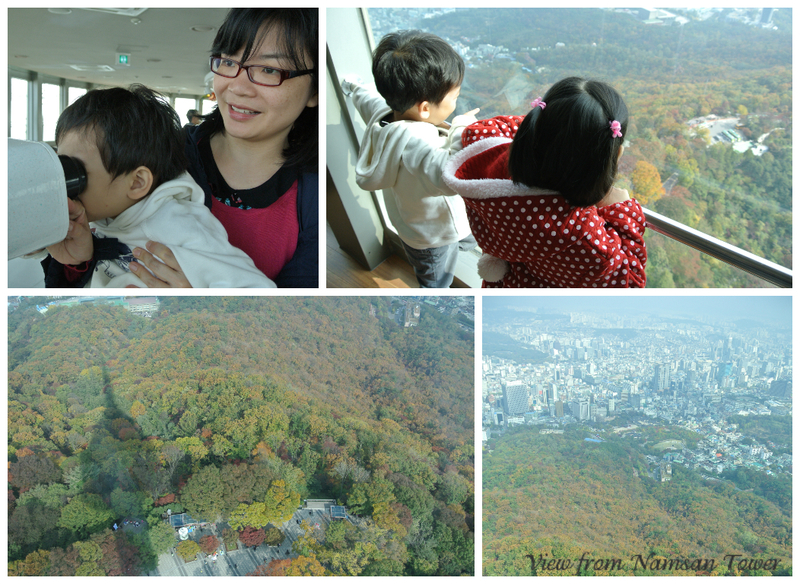 We decided to take a cable car down from Namsan and had our lunch in one of the restaurant that we saw in the morning. After lunch, we decided to head back to the lodge to get Jaydon to rest for the day, when we notice that Jaydon was running a fever. In the evening, when Jaydon woke up from his nap, Jaydon was feeling better. Therefore, we decided to head for Dongdaemun. We decided to find the “toy street” hoping to grab some stationaries and toys for Jaydon. Upon reaching there, all shops are closing and we only manage to get some stationaries. Mary decided to head back to the toy street in the morning. If you like Korean stationaries and toys, this is a paradise for all the stationary you’ve ever imagined. Direction to toy street: Go to Dongdaemun Station and take the Exit 4. Continue to walk on the main road. The Toys street will be the second street on your right. If you go down the street, you will see all the stationaries shop. After that, we head back to the main shopping area where you will find Doota, Migliore & APM. 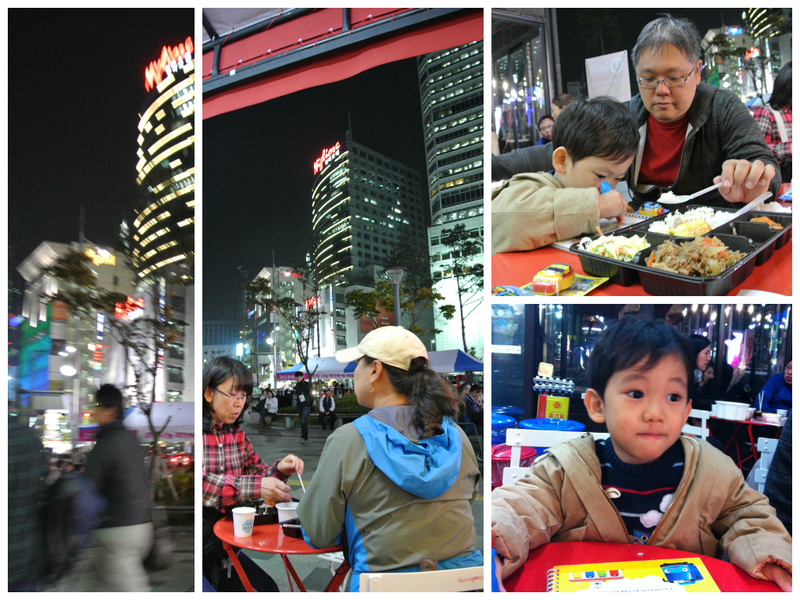 We had our dinner in one of the cafe outdoor since there was a Jazz performance near the cafe, which was nice. After dinner we heads to Migliore and manage to get some winter clothing for Jaydon for our next holiday :). We did wanted to go to these places today. However, I guess we choose to take it slow today.